Morray Engineering sack closing equipment is a great leap towards total automation of your packing line when used in conjunction with conveyor systems and bagging units. Precision sewing head and conveyor speed synchronization. Automatic stitcher start / stop and thread cut off. Fully compatible with theMorray range of sack conveyors. 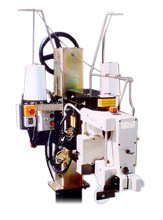 Based on the proven and durable Newlong DS series sewing heads, the DS9 Heavy Duty stitcher provides a high speed, cost effective solution for closing paper, plastic and net bags. Crepe tape attachment with DS-C & DS-9 sewing head. 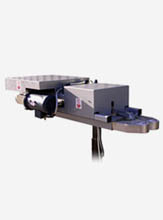 Wide range of conveyors and automated sealing systems. Pillar adaptor kit for Fischbein or Union Special heavy duty sewing heads. Automatic stitch start/stop and pneumatic thread cut off ensuring economic thread usage. 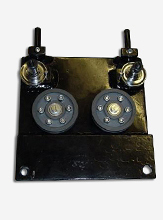 Plug and socket for conveyor supply together with foot switch for conveyor/ stitcher stop restart. Precise sewing head/conveyor speed synchronization by an adjustable pulley between sewing head and motor. Cast and fabricated steel construction for the heaviest duty use. 750 watt motor for high speed effortless stitching. Fully compatible with Morray 850 or 855 stitcher automator. Sewing head swivels through 90 for ease of threading and service. 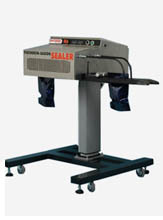 The latest generation of heat sealers for plastic bags. All working parts fully accessible. Electric's housed in a separate IP54 control box with rear housing. Stainless steel body for corrosive environment & medical/food applications. PLC Controller for reliable operation. PID Temperature Control, Low Maintenance. Can be used in conjunction with the M855 auto infeeder. Fully compatible with Morray range of sack conveyors. Both L-R and R-L operation direction versions available. Airevac to remove excess air from bag before full closure. Up to 14.1 meters per minute sealing speed as standard (up to 22.2 meters per minute on request). Stainless steel construction- ideal for food products. Optimized heater airflow for higher operating speeds and increased productivity. Simple setup adjustment- fast product change over. Low profile infeed ensuring correct bag presentation. Efficient and automatic infeed devices capable of presenting filled bags to most fixed head stitchers and heat sealers currently available today. 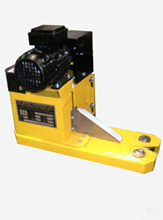 Designed with minimum moving parts & adjustments for simple,effective operation. Ensures parallel stitch - always hold bag under control. Adjustable bag trip switch for different sack profiles. Can be used alone or with the M850 Automator. Efficient, reliable and automatic stitcher accessories to increase productivity of almost any stitching line. Integral proximity switch linked to start/stop stitcher. 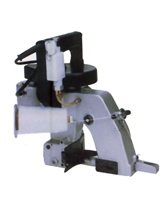 The Morray tractor driven, paper ticket applicator-provides high speed simple operation and designed in reliability. All contact parts in stainless steel -for increased wear resistance, long life and minimum maintenance. Paper ticket sizes from 75mm - 150mm (punched at joint center). PLC controlled (dust free box). Stainless steel magazine for 500 bag / label run. Very easy to use, minimum maintenance..
Can be retro fitted to most existing line & systems. Eliminates stitching failures due to broken thread. 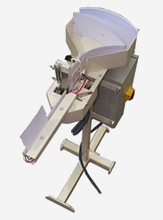 Often, for low throughput producers the most cost effective and practical method of sack closing is a hand held, manual stitching head. 5.3kg total weight with thread. Suitable for Kraft paper, cotton, hessian, jute, woven cloth, plastic and other bag materials. 12V or 110V power supplies to order. Pneumatic motor for hazardous environments. All thread prices delivered free of charge within England and Wales when ordered by the box.